GSMArena team, 16 June 2011. Time to lace up the gloves and step inside the ropes again. A new dual-core competitor, the HTC Sensation, is challenging the current crop of flagship droids with its fast new chipset, high-res screen, sharp-eyed camera and that classic HTC charm much of which is owed to the latest iteration of Sense UI. We already took a lap around our review track with the Sensation but now the usual suspects will line up for a straight forward drag race. There'll be a series of dedicated tests and one simple rule: the first phone across the line wins. This is a dual-core rematch and this time focus will be more on the new kid, the Sensation, than the rest, which we've already covered. Different features have different value to people, so we'll have a series of tests: for the screen, the performance, the camera, GPS and battery. Based on those you can pick your own champion. We'll try to pick an overall winner but it's impossible to single out the ultimate best. 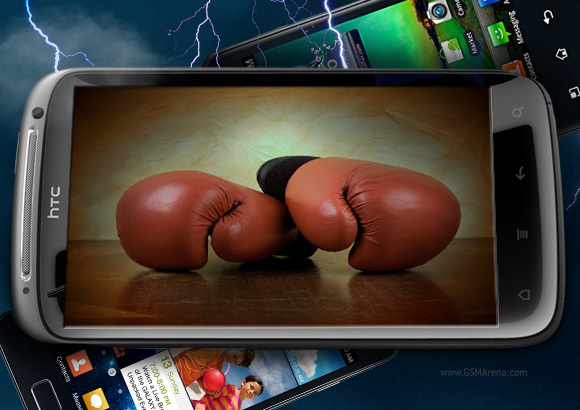 For one, the metal-rich construction of the HTC Sensation puts it a step ahead of the mostly plastic-made competitors. The qHD resolution is very near the distinguished Retina display, but the screen is a massive 4.3-incher, quite bigger than the iPhone 4’s. Also, the Sense UI 3.0 is very polished - there's hardly a nook or cranny left without eye-catching graphics and 3D effects. Underneath all that gloss is tons of functionality too, like the phonebook or the awesome new lockscreen. But you'll have to have a look back at the review for a description of those, today it is all about the high-octane performance. In today’s match, we'll be using three phones primarily: the HTC Sensation, the Samsung Galaxy S II and the LG Optimus 2X. We’ve also invited several other stars for guest appearances: the iPhone 4 has a cameo in our display test, while the Sony Ericsson Xperia Arc features in the still camera comparison. As you see, we have a lot in front of us and competition is quite tight. You can wave the checkered flag now, we - and the droids too - are ready to go.